Early. We woke up earlier than normal. The breakfast buffet the hotel prepares in the mornings wasn’t even ready. It may have been an early morning, but I was glad to have slept like a rock during the night. Mike picked us up at the lobby after breakfast and we left to go to the Great Wall. This is a must see if you go to China. It was surprisingly not far from where we were staying in Beijing. Mike took us to a section of the Wall called “Mutianyu”. We got there early enough that there weren’t too many tourists there. We parked and had to climb a very steep hill to get to a tram that took you the rest of the way up the mountain. The path to the tram was lined on either side with tiny shops. “Good deal for you! Only one dollar!” could be heard echoing through the street. We made it up the hill and jumped on the tram. We had the option of waiting to ride in the same car that Bill Clinton had taken when he was president, but we didn’t take it. 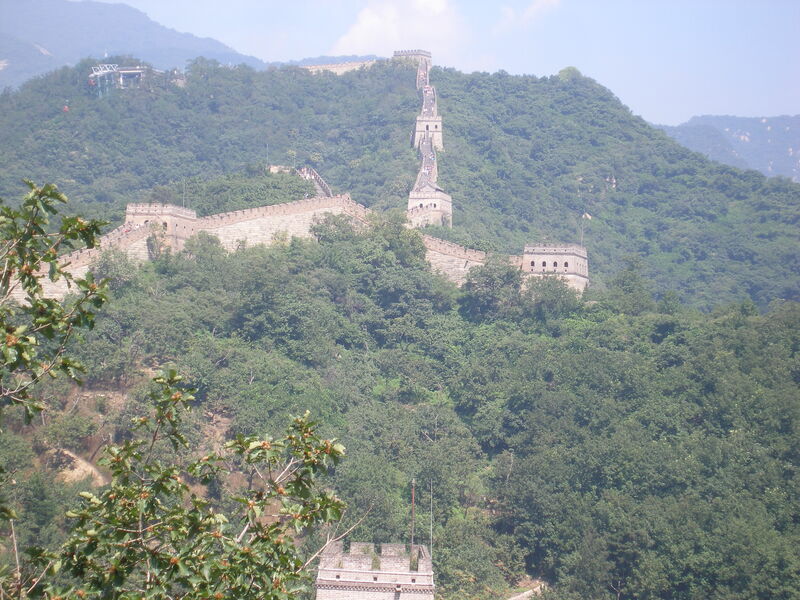 When we got to the wall, there were a few stairs we had to climb to get to the main part of the wall. The stones were steep and worn. 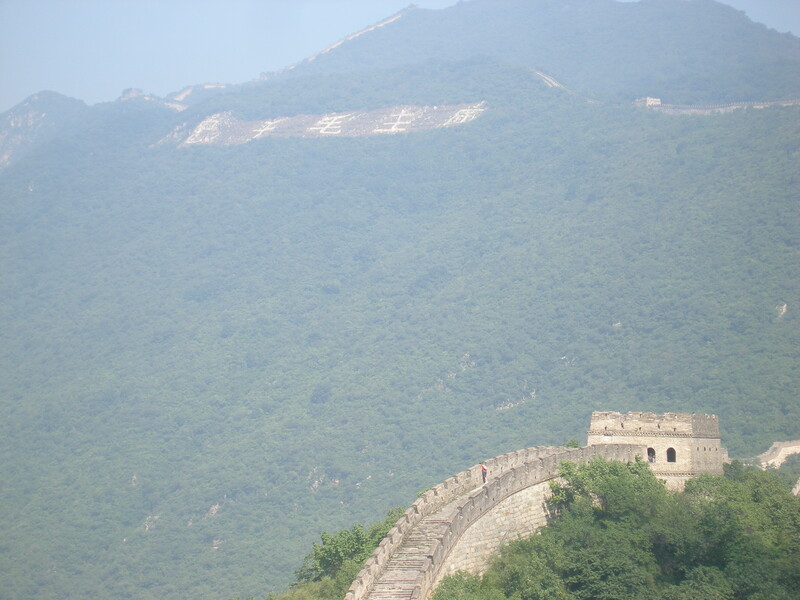 When we made it to the top of the wall, I looked over at the mountain to my left. It had Chinese written on it. I was curious what it said so I asked Mike. He said the characters meant “Loyal to Mao”. Another reminder that this was a communist country. It was easy to forget that sometimes. It felt free, like America, but little reminders would pop up every now and again. Like how Mike didn’t know what Facebook was or how he had never been able to use YouTube. The section of the wall we went to wasn’t very long. I’m sure it wasn’t much more than a mile but it was actually pretty hard work making our way along the wall. It rose and fell with the peaks of the mountain so it was an up and down hill battle. The walk ways were crumbling a little so you had to be very careful where you stepped or else you would take a nasty tumble. It was incredible to see how long the wall went. Farther than I could see. Each post was a nice break because the air would blow through them and create a natural air conditioner. It was wonderful! The whole time we were on the wall all I could think of was “Mulan”. Quotes kept rushing through my head like, “Now all of China knows you are here!” and “How many people does it take to deliver a message?– One”. And of course, the songs from “Mulan” were on repeat inside my head. I even caught myself humming them as I walked along. 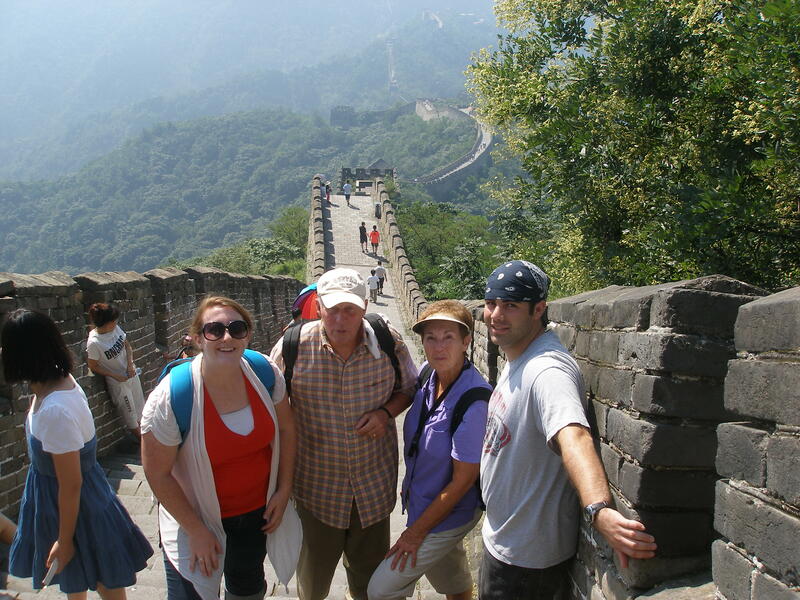 It didn’t take too long to reach the end of our Great Wall tour. At the end we were given the option of walking down the hill or taking a toboggan down the mountain. Needless to say, we took the toboggan. It was so freaking awesome!!! We went down the metal half-pipe at lightning fast speed! Or we would have but sometimes we got in a bit of a traffic jam. At the end of the toboggan ride there were a couple of guys dressed up in old fashioned Chinese clothes so we paid them and took a picture with them. They were really funny guys. I’m glad I got a picture with them. 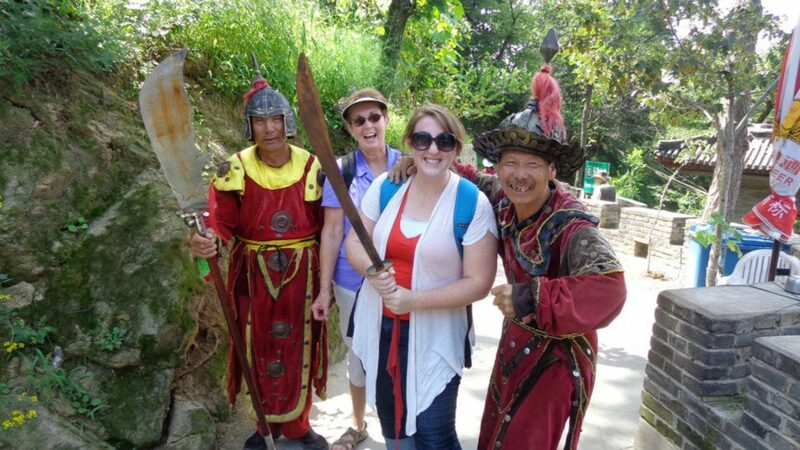 I wanted to get some souvenirs and do some bargaining before we left the Great Wall. I ended up getting a couple of t-shirts that said “I <3 北京 Now more then ever”. I had to buy them because of the grammatical error on the shirt–everyone needs a grammatically incorrect Asia t-shirt. Plus I wanted a Beijing t-shirt. She wanted the equivalent of $50 for two shirts but I talked her down to $40. I felt really good about it too. But…I didn’t bargain very well. I could have gotten them a lot cheaper so Tyler made fun of me for the rest of the day. He still does on occasion. We left the Great Wall and stopped at a roadside restaurant. It was such a cool restaurant because you had to catch your own fish and then they would cook it for you. It was so fun! Tyler caught the fish right away and they cooked it up for us. We had an eggplant dish and some other egg dish. I really liked everything we ate. The egg thing was interesting, but not my favorite. But everything else was really good. We ate outside under a shaded pavilion. The ambiance was wonderful! Next on the agenda was Dragon Gorge!